As the snow melts you want to get out and frolic on the trails! But PLEASE WAIT! But Just Walking in the Mud Won’t Hurt, Will It? Using the trails too soon creates tracks and ruts in the soft ground that harden and make our smooth trails a lot rougher and less pleasant. People can trip or lose control of their bikes when they hit those hardened rough spots. Those tracks and ruts can also keep water from flowing off the trail. When water continues flowing down the trail it erodes the surface of the trail, which can create large holes. When Can I Use the Trails? It takes a while for the trails to dry out enough to use without damaging them. We will let you know when they are ready. Signs will be posted at Birch Hill and we will post updates via the club email and Facebook. What Am I Supposed to do Until Then?! 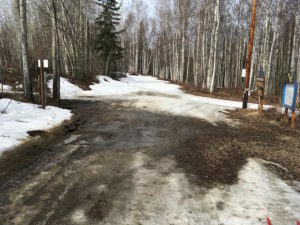 Many other trails throughout the Fairbanks area are in the same situation. However, some are ready sooner than others. Look for well-drained hillside trails with lots of southern exposure. They typically dry out the quickest. Just be ready to turn back if you run into muddy areas. Or explore your community! Get out on foot or by bike and go explore quiet subdivision roads new to you. You get to be outside, be active, and probably find out new things about your community. Check out the Fairbanks Cycle Club, Running Club North, and Fairbanks Area Hiking Club calendars for road rides and runs or other activities.